Texas Ag Commissioner Sid Miller defended his new nutrition policy Wednesday, praising his department's decision to "abolish outdated and unneeded state mandates" and allow schools to install deep fryers and soda machines. 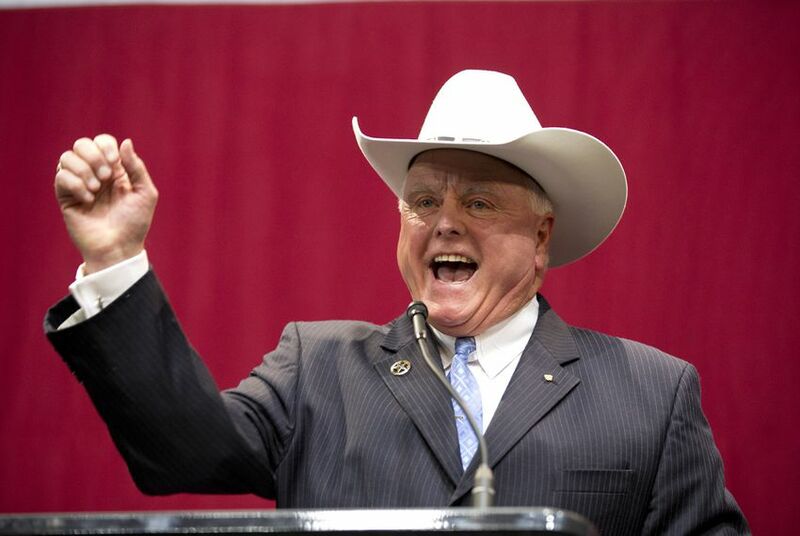 Texas Agriculture Commissioner Sid Miller defended his new nutrition policy Wednesday, praising his department's decision to "abolish outdated and unneeded state mandates" and allow schools to install deep fryers and soda machines if they wish. Giving the annual State of Agriculture address, Miller reflected on his six-month tenure as commissioner — one that has included controversy over everything from sugary snacks to birthday cupcakes — and discussed new initiatives in consumer protection and his fight against what he considers "federal overreach." In defense of his nutrition policy, which has been widely criticized by experts and school officials, Miller said there will be no additional fried foods or sugary drinks on school menus, but campuses now have the option to serve freshly fried foods that previously came frozen. "The problem we have is not serving healthy foods, but instead of having healthy children we have healthy trash cans," Miller said. His wider nutrition policy focuses on connecting farmers with schools to provide more local food. It's designed to promote community engagement and student involvement, as well as training to help schools serve meals that students will want to eat. Miller also announced that he has joined Texas Attorney General Ken Paxton in a lawsuit against the Environmental Protection Agency. Texas is challenging an EPA rule aimed at better defining the scope of bodies of water protected under the Clean Water Act. Republican leaders and members of the farm lobby say the rule will lead to more regulation and a takeover of private property. "Drought, hurricanes and tornadoes are not the biggest threats facing Texans, rather it is an overzealous federal government that seeks to unduly, and often times unlawfully, over-regulate our citizens," Miller said. When it comes to consumer protection violations, which the Department of Agriculture monitors, Miller said 26 new inspectors will work to investigate such offenses. More than 100 cases dealing with compliance violations will be prosecuted by the end of this year, Miller added. Miller, a former House lawmaker, ruffled feathers in the early days of his Ag Commission tenure. He irked lawmakers with his aggressive lobbying for agency funding during the legislative session, faced questions about a proposal to renovate his office and came under fire for hiring a felon who, according to a newspaper report, continued to represent private clients while on the state payroll. "It's been an honor to serve the people of Texas and our farms and ranchers as agriculture commissioner," Miller said. "The work we've done so far is only the beginning. It was my goal from day one to hit the ground running, and I can honestly say that my team and I have done just that."